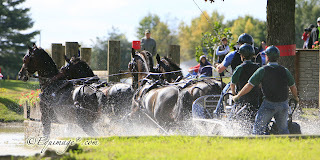 October 1-4 proved to be a worthy test for the 2010 World Equestrian Games as Combined Driving hit the Kentucky Horse Park. 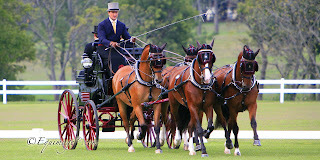 With generally beautiful weather and wonderful footing working in his favor, Chester Weber (FL) and his team snagged a final score of 131.35 to win the Kentucky Cup Test and consequently, a record seventh National Four-in-Hand Championship and an assured place on the 2010 World Equestrian Games Combined Driving Four-in-Hand team. 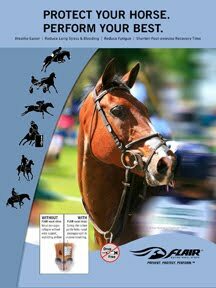 On Thursday afternoon Weber, of Ocala Florida, drove his team of well-matched Dutch Harness Horses, including USEF 2008 Horse of the Year Jamaica at the left wheel hitch, through a seamless dressage test that earned audible praise from the knowledgeable audience. Saturday's Marathon proved to be slightly more problematic as Weber and company had a slight driving error at The Head of the Lake. But, with a mere 6.86 points to spare, Weber maintained his lead going into Sunday's Cones phase where his 2.36 time penalty points held up to give him the win. 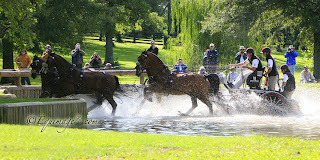 Boyd Excell (AUS) entered Sunday in third place but drove his team at an extended trot through a very quick Cones phase garnering only 3 points for a dropped ball to finish second overall behind Weber with a final score of 138.91. 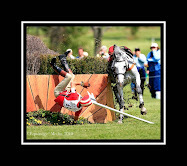 Excell is assured a return trip to Kentucky next year when he and his team will represent Australia for the 2010 World Equestrian Games. Forcing all to work that much harder, the always hard-charging Tucker Johnson (FL) drove his team to third place finish overall with a final score of 141.40, locking down the Reserve National Championship in the process.